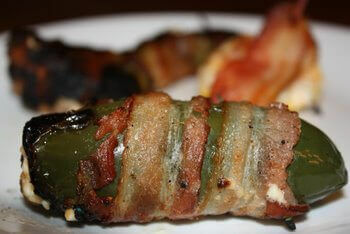 Grilled Jalapeno Poppers Are Simply Delicious! 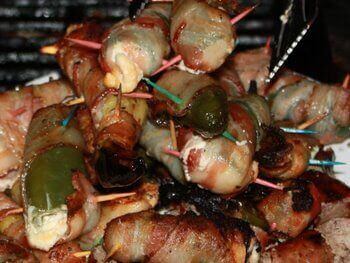 Whether you call 'em ABTs or jalapeno poppers, these bacony, cheesy grilled jalapeno treats are fun to eat! And depending on how they're prepared, they can be spicy hot, or cooler to the tongue, if you prefer to take a walk on the "mild" side. Jalapeno peppers also vary in the amount of heat contained. Growing conditions can affect the heat level of the peppers, as can the variety. Some varieties have been developed that have very little heat. Try one before you prep them so you know what you're working with. To reduce the heat, be sure to remove all the seeds when removing the seedy pepper core. Also, scrape out any whitish membrane you see. A quick rinse of the pepper interior with running, hot water will pull out a bit more of the heat. The level of doneness the peppers reach also affects the heat. The more the peppers are cooked, the less hot they'll be. If you want them to be hot, allow a few of the seeds to remain inside the jalapeno popper pepper, and cook them until just barely tender. In the produce section, I often see jalapeno peppers that are rough and shriveled up, or that are covered with brown spots. Even though they'll be covered with that glorious grilled bacon, be sure to find nice, fresh peppers for the best flavor. The cheese mixture in these holds up pretty well to heat. I've had very little problem with that gooey goodness escaping. Start by cutting the tops off of all the peppers. Then remove the seedy cores, all seeds and membranes you can see. I've used small knives to remove the cores, and the handle ends of teaspoons too. One tool that's really effective is a vegetable peeler. Stick it in and give it a twist, and the seed core comes right out. Mix the mozzarella and cream cheeses up in a medium mixing bowl. Fill each pepper to just overflowing with the cheesy conglomeration, just so there's a little mound over the open end. Now for the bacon. You can get by with a half slice wrapped around each pepper, but why? A full slice makes them twice as good! Start by covering the cheese mound with a short wrap of bacon, then spirally wrap the rest around the pepper, ending at the tip. Use a couple of toothpicks to hold the bacon in place. Stick them through the peppers in the same direction, so they lay nicely on the grill. Indirect grilling is the way to go for these babies. You don't want the to cook too fast, or the bacon will become too crispy, possibly burning, before the meat of the pepper is done. Medium or medium low heat is perfect.